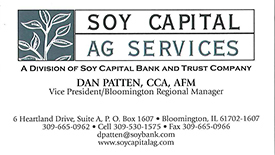 With Bloomington’s Stormwater funding, the city matched federal funding with the IDR’s State Wildlife Grant for habitat enhancement and NRCS’s Conservation Innovation Grant for nutrient management in agricultural runoff. Figure 1 Sediment benches in drainage ditch and in the two stage drainage ditch with a larger excavated sediment bench. 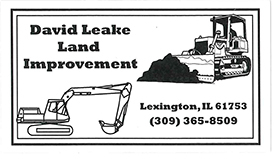 Bloomington selected the two stage ditch as the practice to be applied in Phase 3 of the Grove Restoration on the West Branch on the West Branch of Kickapoo Creek. The typical agricultural two stage ditch is widened at the elevations of sediment benches deposited in the bed of normal agricultural ditch (figure 1). Figure 2- The drainage ditch was excavated to a wider ditch with a larger floodplain area, which was seeded with prairie grasses. 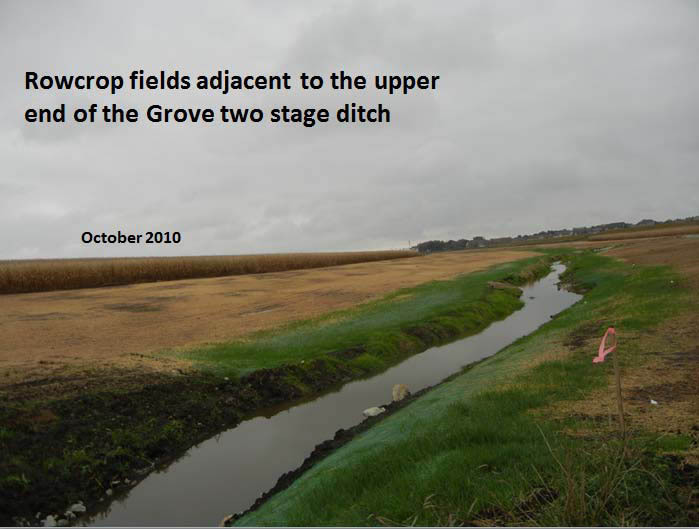 The Grove two stage ditch practice was modified to include significant stormwater storage (36 acre ft.) in the prairie wetland complex adjacent to the ditch (figure 2). Figure 3. 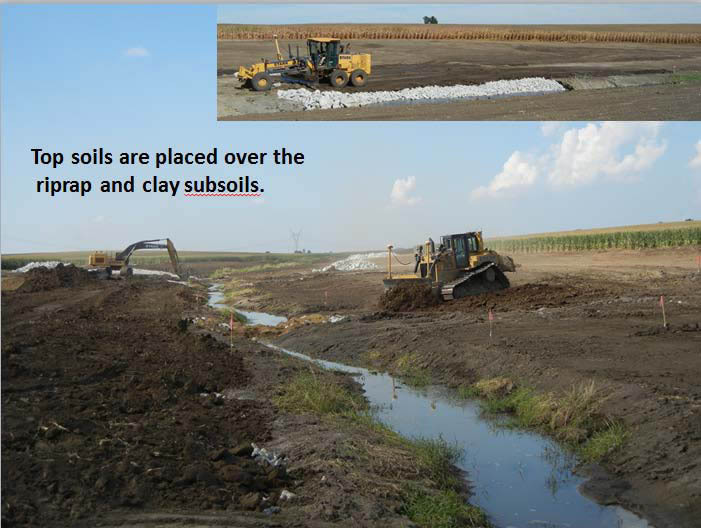 Excavation lowered the rowcrop fields to form the sediment benches and floodplain required for stormwater detention in Phase 3. 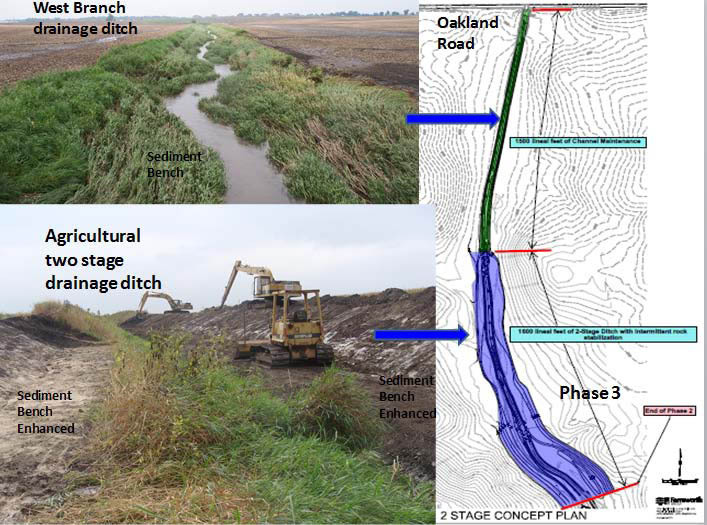 In Phase 3 of the Grove Park restoration, the banks of the two stage ditch were lowered and widened at the floodplain elevations to meet the city’s required 36 acre-ft. storage for residential runoff of 2000 new homes for the Phase 3 area of the park (figure 3). Figure 4. Survey stakes set elevations for the excavation of rowcrop fields to form the sediment benches of the two stage ditch and the prairie floodplain required for stormwater storage in Phase 3. 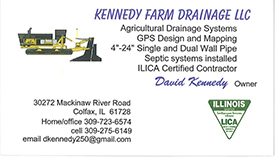 All excavation and riprap placement was completed by September 9th of 2011. 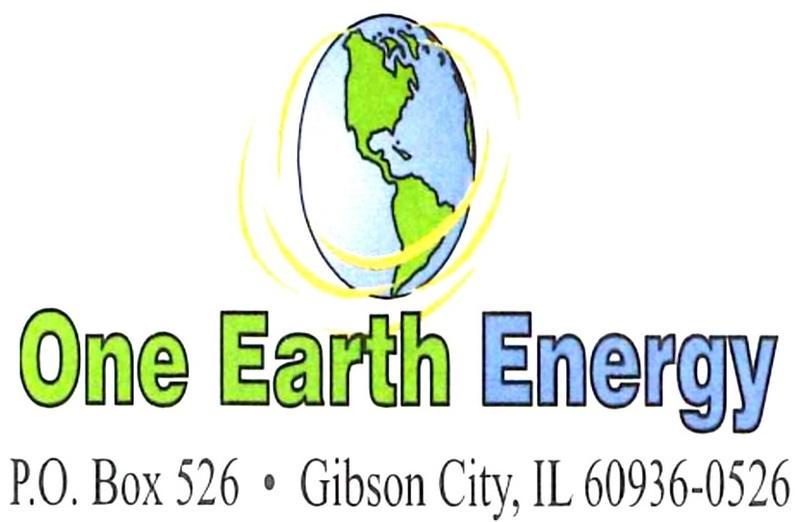 Approximately 1450 feet of the west bank was stabilized with riprap. 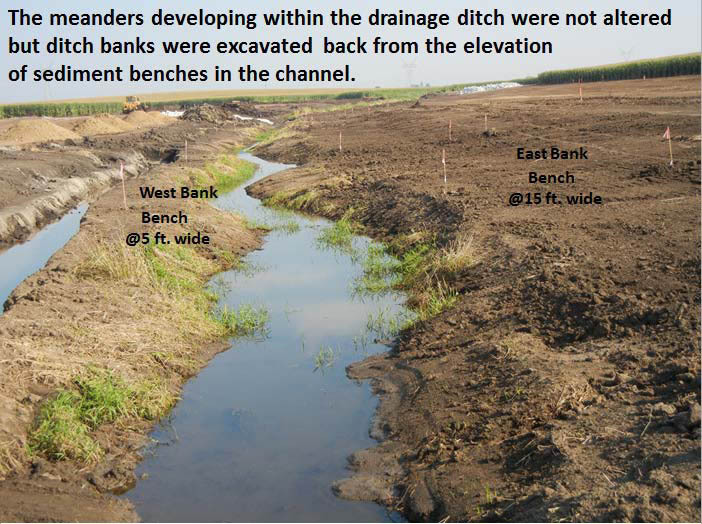 Rock was installed along the west edge of the five foot wide sediment bench on the west bank (figure 5). Figure 5. 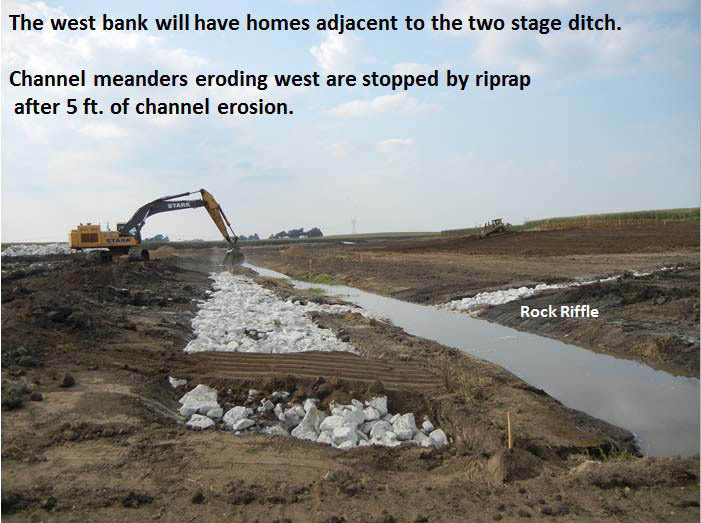 The west bank of the two stage ditch was stabilized by riprap placed between the ditch bank and the west sediment bench. With the exception of areas adjacent to the rock chute and the wetland outlet, the east bank had no rock bank protection. The ditch channel will meander across the sediment benches within the rock limitations on migration. Figure 6. Rock keys extend 12 ft. into the east sediment bench (15 ft. wide) to limit meander migration. 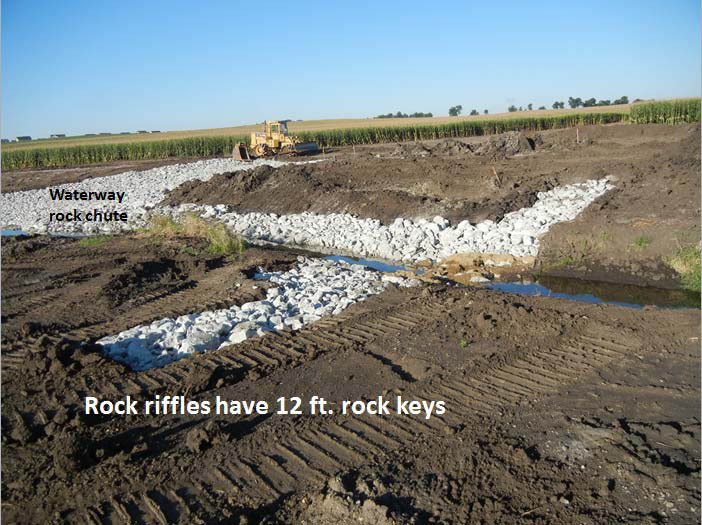 Sixteen rock riffles were constructed as instream habitat enhancements within the two stage ditch. Rock keys were extended across the sediment bench for 12 ft. (figures 6-9). Figure 7. Soils are compacted over the riprap in preparation for prairie seeding and mulching blankets for plant growth. Figure 8. 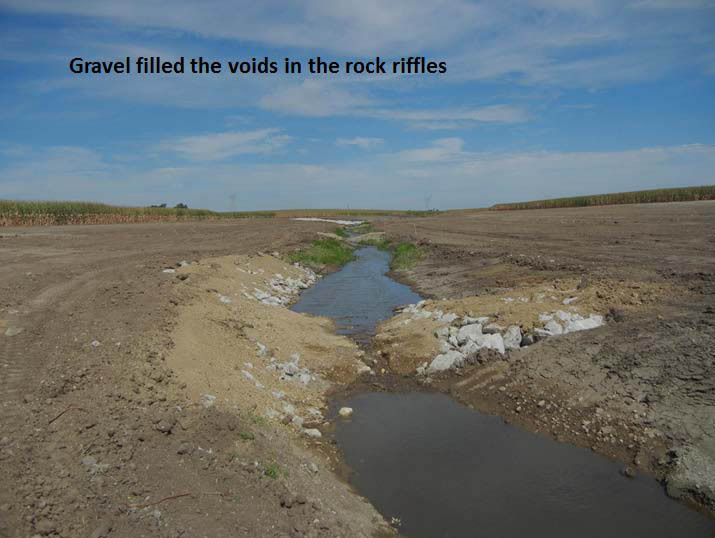 Gravel and sands are placed into the voids in the rock riffles to decrease subflow through the riprap. Figure 9. Cover crops of oats and winter wheat quickly grow through the mulch blankets to protect prairie seed until spring growth. In addition, a waterway rock chute was constructed where the large rowcrop waterway entered the ditch from the west. 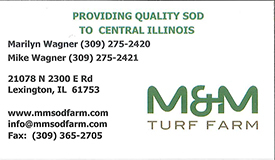 The field waterways were replanted with cover crops and warm season grasses (figures 10-11). Figure 10. 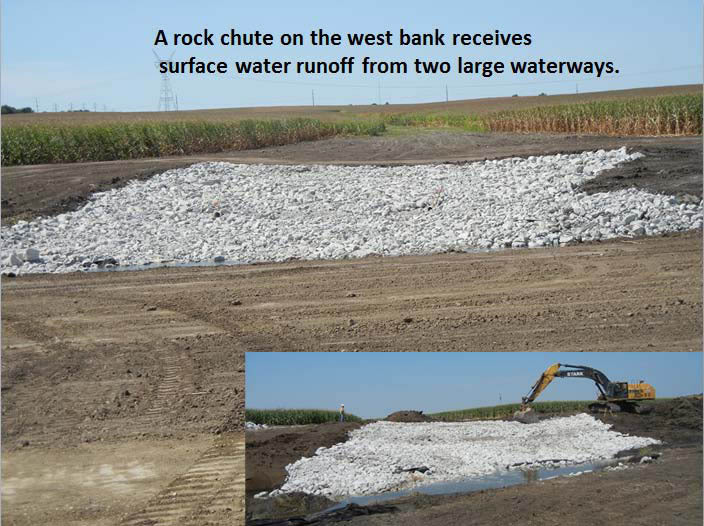 A very large rock chute captures the surface water runoff from two large waterways draining rowcrop fields from the west. Figure 11. 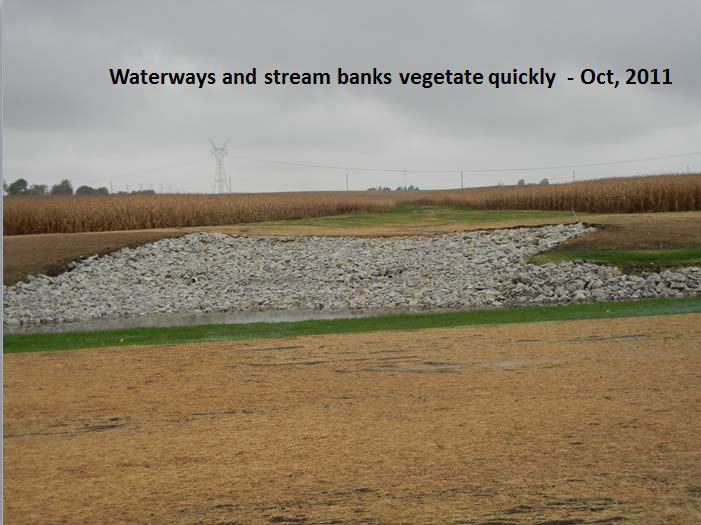 With straw mulching and excelsior blankets, both waterways and stream banks have rapid revegetation in October. A wetland was excavated to capture runoff from future housing and increase water quality by wetland plant uptake of nutrients. The wetland was excavated in late August and planted in September (figure 12). Figure 12. 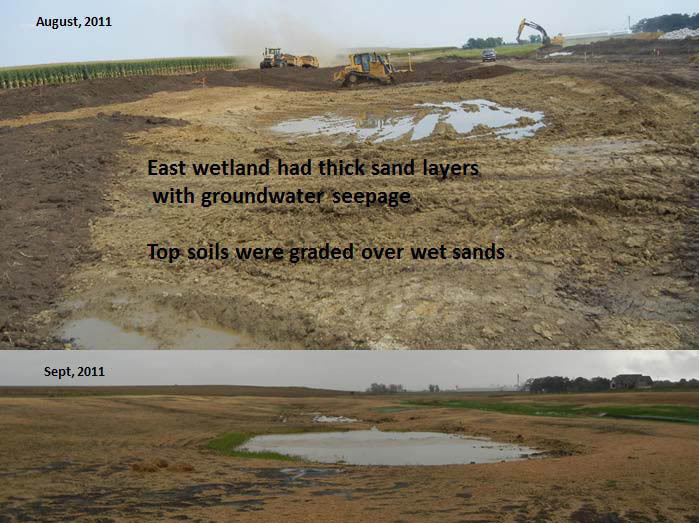 The east wetland was excavated in late August and a thick sand layer carried groundwater to the surface. 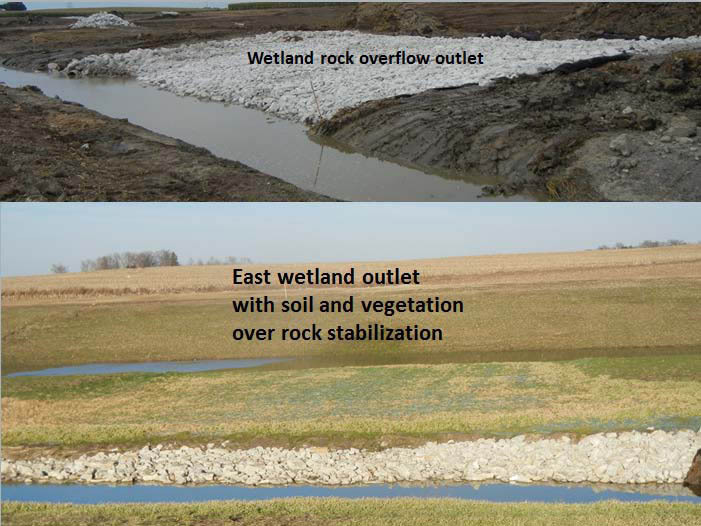 The outlet overflow of the east wetland was stabilized with riprap and vegetation (figures 13). Figure 13. 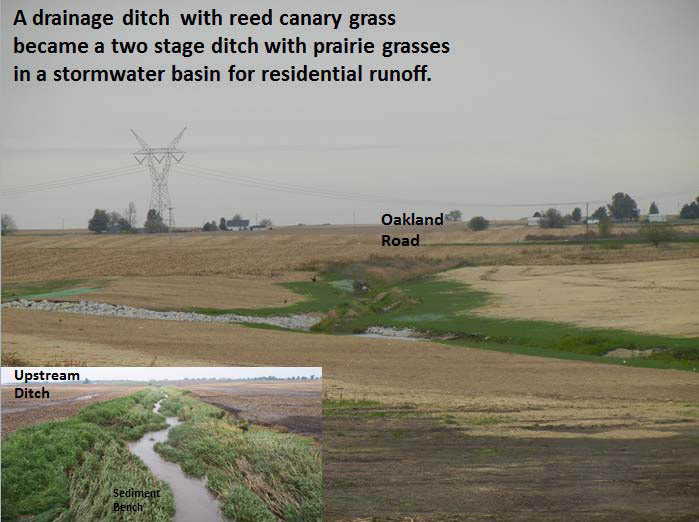 With surface runoff from a large area of rowcrops or future housing enters the wetland, the wetland overflow required both rock and vegetative stabilization. All cover crop and prairie seeding in Phase 3 were completed by September 30th of 2011. 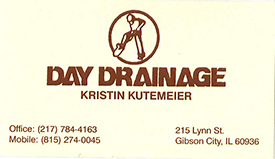 Ditch maintenance activity in the upstream drainage ditch will be completed in 2012. 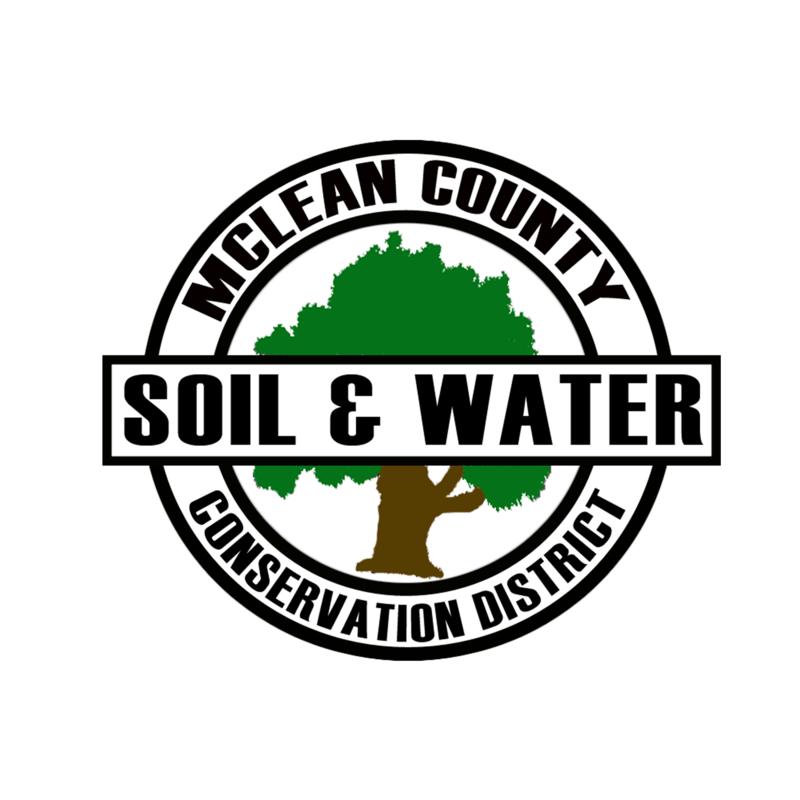 The city utilizes green infra-structure practices to increase nutrient reduction and have modified the agricultural practice to increase stormwater storage and increase water quality of agricultural and residential runoff. The West Branch of the Kickapoo Creek receives runoff from 2500 acres of rowcrop in the park (figures 14 and 15). Figure 14. 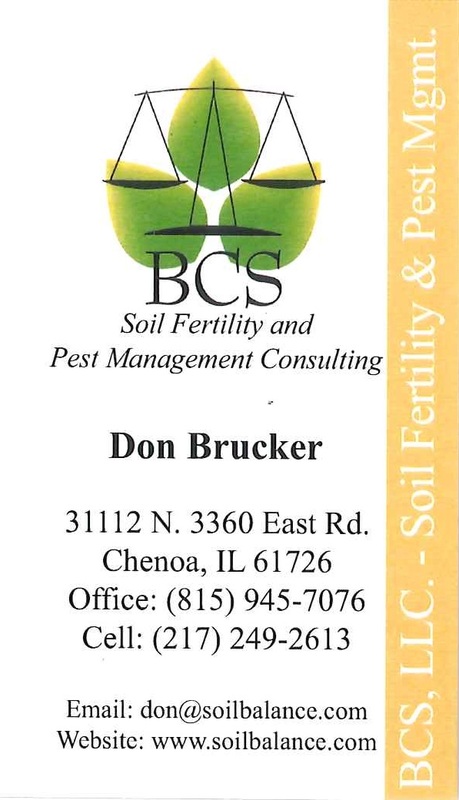 Until the housing market returns corn and soybean fields will supply the majority of surface water runoff into Phase 3. 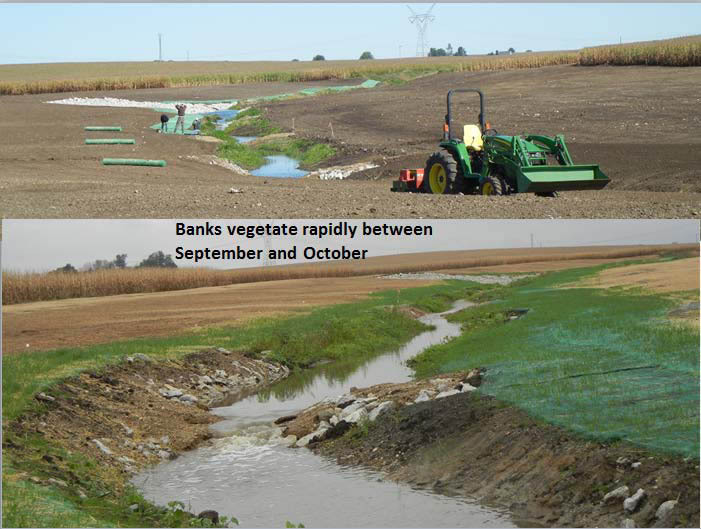 Prairie and wetland vegetation is planted in Phase 3 to increase nutrient uptake in the modified two stage ditch practice. The prairie vegetation will require 3 growing seasons to achieve a mature effective plant community. Figure 15. 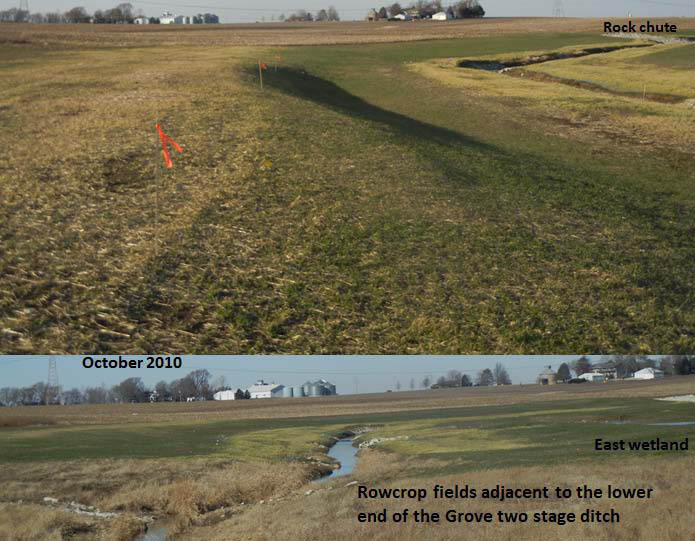 Rowcrop fields are the dominant landuse in this watershed and provide a suitable site for monitoring nutrient reduction and fishery increases in this two stage ditch application. The US Geological Survey will monitor discharge, sediment loadings and nutrient loading of large floods to measure nutrient reductions and sedimentation rates within the Phase 3 restoration. IDNR stream fishery staff will monitor stream fishery populations as the two stage ditch evolves during flooding and the maturing prairie vegetation. 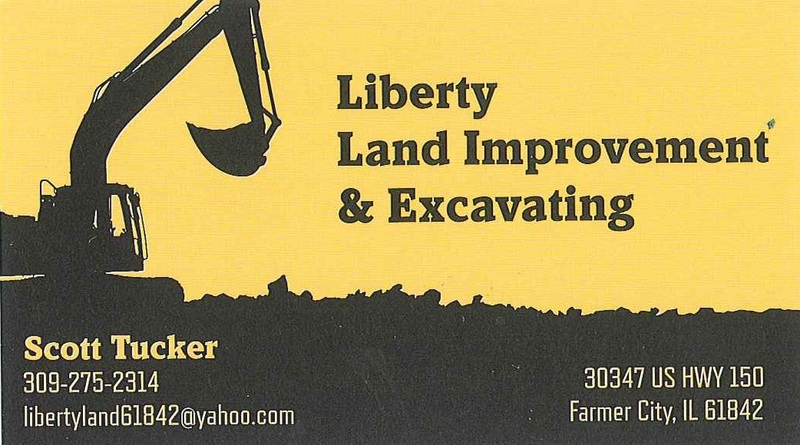 Bloomington Park staff and their consultants will determine the maturity of the prairie and wetland plant community.